Featuring Upscale, Downscale, Passthru and Bypass mode as well as Chroma Conversion and Color Depth modification on the fly at 8, 10, 12 and 16bit for FHD, UHD and DCI 4096x2160p. Providing a total of 4 HDCP 1.4 and 2.2 engines for decryption/encryption, HDfury Linker offers a workaround for HDCP issue including HDCP 2.2 > HDCP 1.4 and HDCP 1.4 > HDCP 2.2 both ways conversion within the same unit. 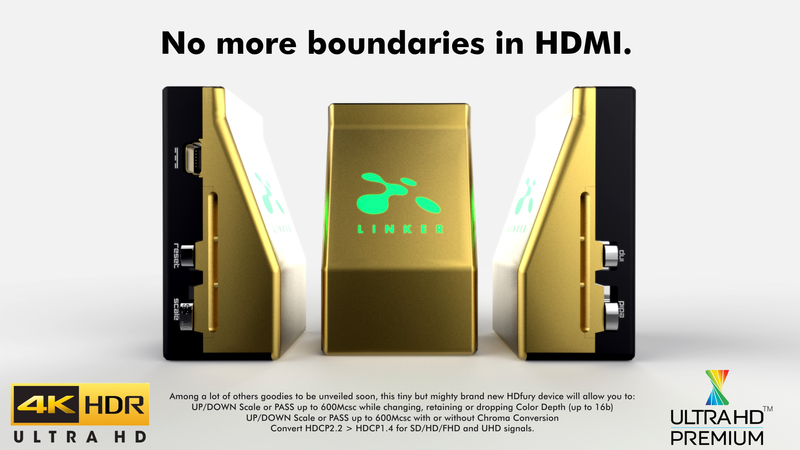 Unlike HDfury Integral that can convert any signals within the 600MHz bandwidth of HDMI2.0a, thus including 1080i, 3D signals, PC signals and all SD/HD/FHD/UHD standard formats, HDfury Linker only support HDCP conversion for SD/HD/FHD/UHD signals up to 600MHz. 1080i, 3D signals, PC signals (except a few manually added) cannot be HDCP converted with the HDfury Linker, they go through in Bypass mode (untouched/untouchable). Switching between 2 inputs up to 4K60 4:4:4 600MHz signal and scaling through all HDMI levels and revision is now a reality, thanx to USB or push button, you can easily switch between 2 inputs that will be scaled to one output. HDCP conversion can be configured and applied on the fly in order to always output the type of HDCP signal encryption that your display or sink device is expecting. Select and pick any EDID of your choice from a list of 25 EDID tables, it loads and reset HPD to present your chosen one automatically. External Wi-Fi/Bluetooth dongle for iOS/Android control might be available in the future. There is chance the 4K Linker will be able to convert 709<>BT2020, both ways, in the near future but it’s not yet a guaranteed feature. Work in progress. Discover what Eurogamer.net have to say about it. Some players with 1080p displays have asked if there is any way to access PS4 Pro game modes only available on 4K screens - specifically down-sampling modes like those stripped from TLOUR. Yes there is, we've tested it and it works - but it is somewhat expensive. You'll need a device known as the HD Linker. It's designed to enable UHD functionality on 1080p screens but that's just one of its many functions. Users connect the HD Linker between the Pro and a 1080p display and it's powered via USB. The Pro sees that it's attached to an HDCP 2.2-compliant display and the Linker effectively downscales the Pro's 4K output to full HD. We've tested it on a Pro attached to a Panasonic VT20 plasma display and it works just fine - 4K functionality is accessible from the video output settings menu as per normal, even though a full HD screen is attached. As the Pro believes it is attached to an HDCP 2.2-compliant screen, you can also access non-gaming features too - such as the ultra HD encodes on Netflix, giving an almost Blu-ray-like presentation. At $199, it's effectively half the cost of the console itself so we mean it when we say that it's expensive - but it does do the job. A few switchs on the HDfury Linker can be set once depending on the HDMI/HDCP revision required by your TV. No other setup is required. For more information download the User Manual.